A study in USA found the vast majority of CO₂ emissions – 86% – came from the car’s fuel use. Just 4% of emissions came from making and assembling the car. This option is becoming increasingly viable for many office-based jobs, and if your workplace offers it, look into the potential of using it for at least some of your working week. 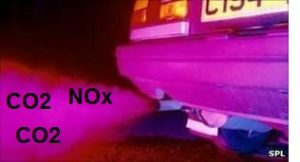 When we burn diesel and petrol in a vehicle, some greenhouse gases are emitted – carbon dioxide (CO₂) we know about, but there are other harmful greenhouse gases called nitrogen oxides (NOx). These are particularly harmful to us and thought to be responsible for up to 40,000 deaths in the UK every year. The production of an average car before it is driven away by the new proud owner creates around 15 tons of waste and 75 million cubic metres of polluted air.